When you are eight months into your pregnancy, you should have a hospital bag ready. This is the time where surprises might happen and your little one could not wait to get out and say Hello. Here are a list of items that should be packed in your hospital bag – highly recommended by experienced mums! 1. Toiletries. The first thing you will like to do after giving birth is to have a nice shower. Bring your own shampoo, body wash, toothbrush, skin and body care products. Trust me, you can’t count on the hospital to have suitable products for everybody. 2. Breast pads and comfortable nursing bra. After giving birth, you breast are likely to be sore and painful. A good bra can provides comfort and also, help to absorb leaks. 3. Make-up. Yes, you have just delivered and don’t have the energy to care about how you look like but think again, you are going to look at these photos goes viral, at least for the next few days on social-media sites and the same set of photos for the rest of your life. 4. Pillow. Bring your own little pillow from home to save you from all the discomforts and aches that will follow after giving birth. 5. Camera. Bring a camera that is fully-charged or best, bring extra batteries. This is a special once-in-a-lifetime moment that you will want to revisit over the years. You will definitely want to captures tons of photos of your little prince or princess and the family and friends that come to visit. 6. Mobile phone. Yes, of cause but don’t ever forget the charger. You will be busy calling, messaging, Facebooking, Instagraming and taking tons of photos that you will deplete the battery much faster than you have expected. 7. Snacks or bread. It will really be good to have some light food packed in your hospital bag. You do not wish to wake up in the middle of the night, suffering from hunger pangs. Bring some for your partner as well who will be there for you all these while. 8. Extra-long/Extra-Heavy flow sanitary pads. The ones at the hospital haven’t changed in a century. Seriously, they practically have belts. A box of extra strength Always will be one of the best investments you make. 9. A comfortable outfit for you to wear. Bring something that is easy for you to put on and we strongly recommend you to bring your maternity yoga pants or stretchable pants because you’ll probably still look like you are 5 or 6 months pregnant. 10. A cute little outfit for your baby. This will be the first little outfit for your gorgeous little baby. Choose a cute and fun little outfit for him/her. 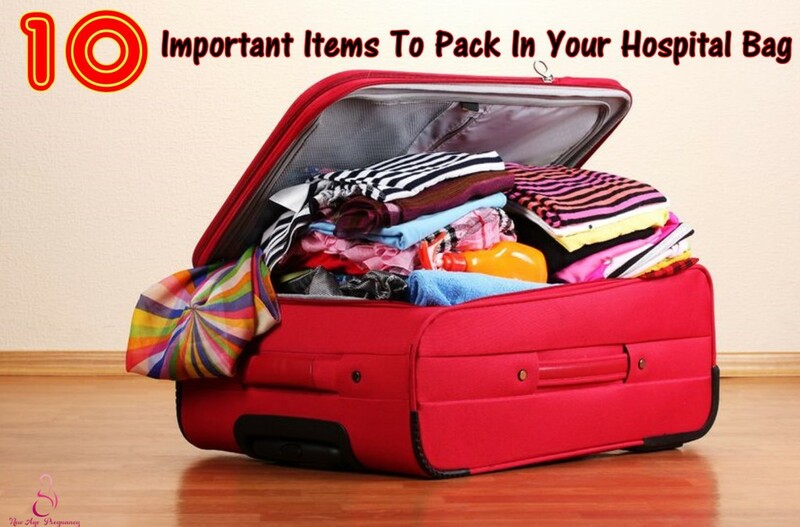 All these items should be packed in your hospital bag earlier so that you will not have to rush it off when the time comes. You may also want to bring another big bag or two to house the gifts from family and friends. How To Bond With Your Baby Before Birth? Can You Seek Dental Treatment During Pregnancy?